2018 held at Prairie Island Athletic Complex in Prairie Island, MN on August 25-16. Prairie Island was the host for the 2018 ASA B Men’s Slow Pitch National in 2018 as the ASA Hall of Fame Stadium would begin the second round of construction to assemble the press box and second deck. The pre-tournament chatter was about conference A or better teams and the defending champion, L&S Glass, were allowed to play in the tournament. The semifinals featured four area teams while the winner’s bracket was wrecked by unseeded teams. Heartland Investors of Mandan, ND came out on top with local star and former Team USA pitcher Geno Buck would lead the way. 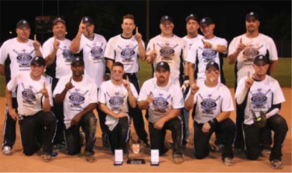 Heartland Investors won ASA B Nationals the last time it was in Minnesota (Andover’s Sunshine Park) in 2013. 2008 held at Hall of Fame Stadium in Oklahoma City, Oklahoma. Lighthouse suffered its first loss of the Series on the final day, but came back with a win to take home the Hooters Championship Series Men’s B Crown with a 3-1 record. Lighthouse took the first two games before a neck and neck game three as no team led by more than two runs. They were tied going into the seventh inning, but Redwood outscored Lighthouse, 4-2 to take home a 13-11 victory and keep the series alive. Lance Dalbey (Minneapolis, MN) led the way for Redwood going 4-for-4 with three runs scored. The win pushed a game four where Lighthouse secured their title with a 12-2 win. Lighthouse’s Jason Branch (Brooksville, Fla.) scored two runs while going 3-for-4 with three RBI. The series MVP was awarded to third baseman Donnie Burkhalter (Clermont, Fla.) who was 6-for-11 with three home runs and seven RBI. 2008 East held at Auburndale, Florida on August 28-September 1. 2008 West held at San Antonio, Texas on August 28-September 1. Finishing in the wee hours of the morning, the Men’s C title was gutted out by CA/JO and Suburban/SKS ending at 1:40 a.m. with Suburban/SKS on top 14 to 13 in eight innings. CA/JO made a valiant effort in the bottom of the seventh inning scoring seven runs to tie the game at 13 before the winning run was walked in for Suburban/ SKS to take home the title trophy. Representing the North in the first year of the four corners concept for Men’s Class C, Suburban/SKS finished their pool play at 1-2 and came into the final day as the No. 2 seed. They were 2-0 in the bracket coming into the first match-up with CA-JO, but their bats fell short in a 20-8 defeat forcing the “if game.” But with their spirits and energy high after midnight, they burned the midnight oil in order to claim the title of 2008 ASA Men’s Class C National Champions. The MVP award was given to Todd Fairbanks (Jackson, Mich.) who led all batters for Suburban/SKS hitting .636 (14-of-22) for the weekend. As a team, the champions hit .484 with six total home runs recorded. ASA C East held at Salem, Virginia on August 28-September 1. ASA C North held at Moorhead Softball Complex in Moorhead, Minnesota on August 28-September 1. ASA C South held at Bryan/College Station, Texas on August 28-September 1. ASA C West held at Big 8 Softball Complex in Lancaster, California on August 28-September 1. 2001 held at Portland, Oregon at Delta Park on September 21-23. Texas/AAA of Longview won the ASA Class B Western National Softball Tournament held September 21-23 in Portland, Oregon. The team went 9-1 in the 41-team event, defeating Bud Light of Owatonna, Minn., in the championship. Texas/AAA also won the ASA State Tournament, the NSA State Tournament, and finished third in the USSSA State Tournament. The team, coached and sponsored by Dan Melton and Jack Greer, qualified to play the Eastern National winner at the ASA Hall of Fame Stadium in Oklahoma City. Texas/AAA team members are Steve Hall, tournament MVP; all-americans Bud Weathers, Ryan Verde, Chris Griffin, Scotty Stanley, Richard Boring, Randy Crawford, and Brian Mack; Harold Slate, Scottie McDowell, Mike Scoggin, Roger Kirkland, Casey Bowers, Bart Bradley and Trinity Greer. The tournament had 64 teams entered and paid originally but 16 teams could not make it to Portland due to flights getting cancelled from 9/11. The airspace was barely open at that point and no one was sure if the tournament would even occur. Tournament favorite Team Miken of Caledonia, MN had all sorts of issues getting enough players to the tournament which caused them to dump an early game and could never recover from it finishing in a tie for 13th place. 1999 held at Montgomery, Alabama on September 23-26. Caraway of Alabama and Miller McGaffer of Illinois met three times in the ASA Class B national tournament at Lagoon Park in Montgomery, Ala. Caraway won two, and claimed the national title. A grand slam home run by MVP to be Paul Judah gave Caraway a 21-18 win in the semifinal round of the winners bracket. Miller McGaffer, which won a game late Saturday night and three on Sunday, forced an extra game in the championship round with a 31-12 romp as Scott Becker hit two home runs and Jim Walsh, Jim Lynch and Jeff Sahazian and John Doss one each. Walsh and Dave Shaff each had 4 hits. Lynch had a single and 2-run HR in a 10-run top of the first. Miller McGaffer built a 17-12 lead going into the bottom of the fourth of the deciding game. Caraway broke loose for 8 runs, with the big blow being a grand slam home run by Keith Eldridge. Caraway won 32-27 as Eldridge went on to total 9 RBI in the game. He had a 3-runner in a 12-run bottom of the fifth, and 3 homers in the game. He had 8 for the tournament. Becker was the tourney leader with 10. Other Caraway homers in the 12-run inning included a 2-runner by Andrew Judah and a 3-runner by Paul Judah. For the game, Eldridge was 4-for-5, Paul Judah 4-for-6. Jeff and Bill Sahagian each had 2 HRs for Miller. Key plays for Caraway in the infield in the last inning were made by second baseman Craig English, middle infielder Sandy Jones and pitcher J.R. Phillips. Held at Albuquerque, New Mexico on September 26-29.